MANSFIELD, Mass. 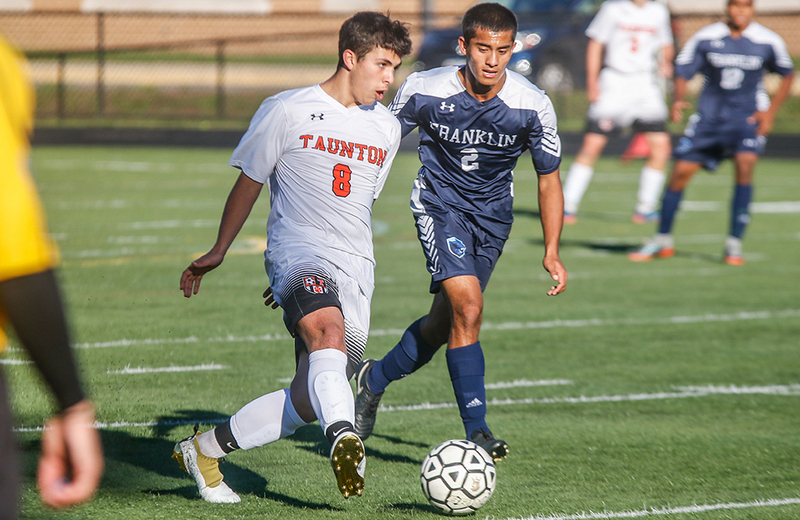 – In the second half, the Mansfield boys soccer team applied plenty of pressure against Brockton, creating chances off corner kicks and throw ins. 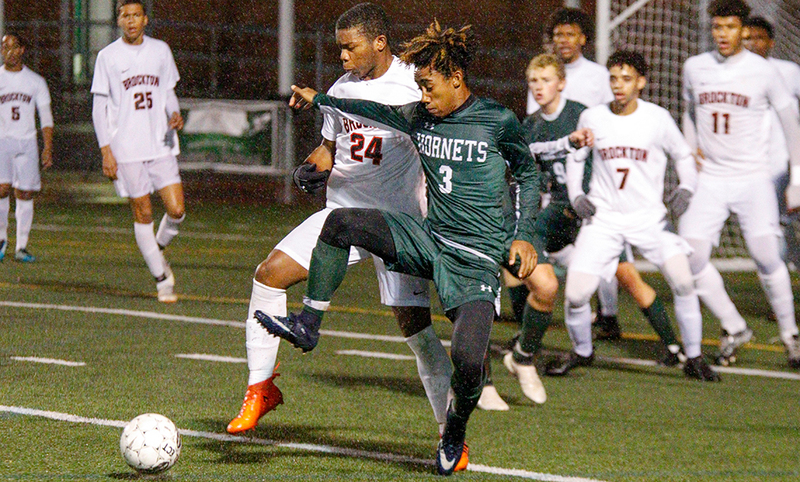 But the Hornets couldn’t break through, and the pressure came just a bit too late as #11 Brockton used a pair of first half goals and added a third one on a counter attack midway through the second half to secure a 3-0 victory over #3 Mansfield. The Boxers, a team much better than your typical #11 seed, had complete control over the first 40 minutes of the game. Brockton had a lion’s share of the possession and neutralized Mansfield’s attempts to get up field. “They have a hell of a lot of talent over there,” said Mansfield head coach Steve Sheridan. While the Boxers didn’t create a ton of goal scoring chances, they did capitalize on the opportunities they did have. After controlling the game of the opening 15 minutes, the visitors found the back of the net to go ahead. After earning a free kick along the right flank, Brockton’s Luis Spinola served the ball to the near post to teammate Leonardo Teixeira. Teixeira had his first touch blocked down but tracked it down and fired in a shot at the near post on a tough angle to make it 1-0. While Mansfield began to work its way into the game some, earning its first corner and first real attacking throw in, the Boxers struck again in the 33rd minute. Vanilton Xavier and Teixeira combined to get Xavier out wide. After using a cut back to avoid two defenders and centered it back to Teixeira, who headed in a ball he played up to himself. Mansfield’s lone chance of the opening half came off the foot of junior Colin Caridi, who blasted a low shot from 20 yards out but it slid wide at the far post. The second half came to an abrupt halt just over minutes in because of a lightning delay. After the teams cleared the field, play resumed 36 minutes later. After the delay, the Hornets ramped up the pressure. Mansfield had three straight conner kicks in the 38th minute, but only the final one had a chance on goal with Luke Savoie’s header saved on a bounce. While Teixeira didn’t play a lot of minutes for Brockton in the second half, he did have a chance in the 51st minute but Mansfield junior keeper Cam Bovey made the stop. While the Hornets pushed numbers forward, the chances on goal didn’t pile up. Instead, the Boxers were able to strike on a quick counter attack. Edson Lopes played Joel Arsenault wide but as soon as Lopes released the ball, he took off sprinting forward and was rewarded for his run as Arsenault slipped a ball in behind and Lopes touched it around the keeper for a 3-0 lead in the 60th minute. 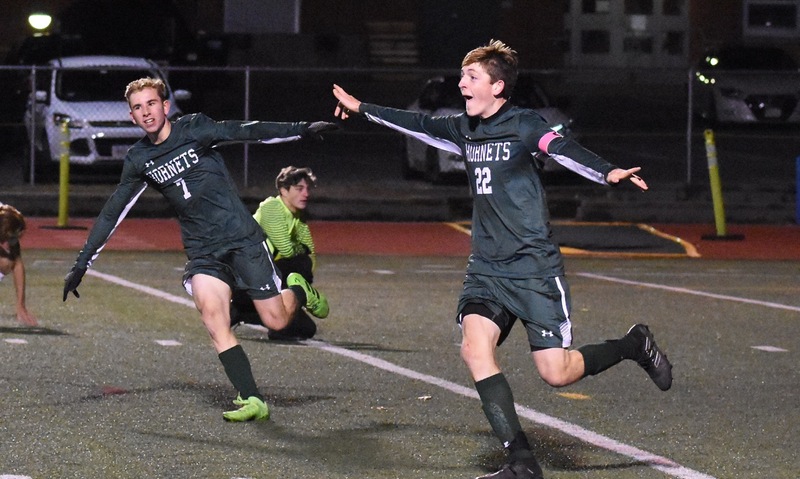 Mansfield’s best chance of the game came a minute later as Luke Devine flicked a ball in behind on a header and Savoie fired a hard low shot across the goal but it hit off the far post and rolled across the goal line, somehow staying out and keeping the Hornets scoreless. Mansfield boys soccer finishes the season 13-3-5.